PVA Tears Lubricating Eye Drops for relief of dry eye. 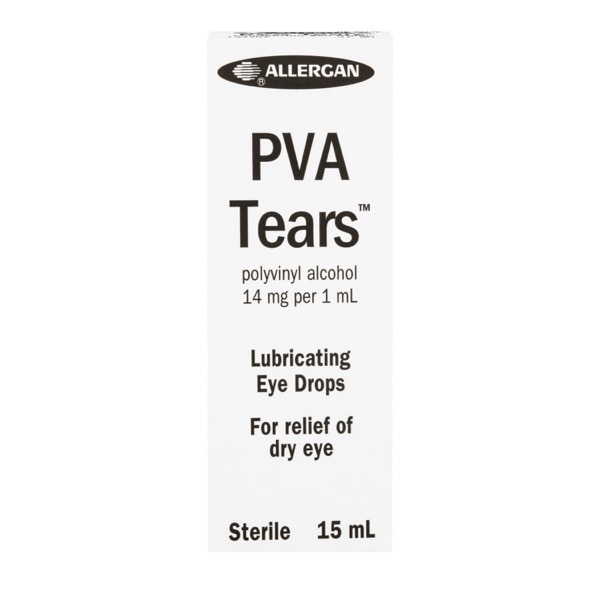 PVA TearsTM Eye Drops soothe and lubricate dry eye(s) and provide greater comfort and longer wearing time of hard contact lenses. Polyvinyl alcohol 14mg per 1mL. If irritation persists or increases, discontinue use. Keep container tightly closed. Do not touch tip to any surface as this may contaminate the solution. Discard unused contents 4 weeks after opening. Contents are sterile if seal is intact. For external use only. Not for use with soft contact lenses. Each mL contains: Polyvinyl Alcohol 14 mg, Benzalkonium Chloride 50 µg (as Preservative). One drop in the eye as needed or as directed.